And my what a wonderful summary we have. Eight batteries with eight returns showing! Battery A: At Portsmouth, Virginia with four 12-pdr Napoleons. Well, Lieutenant John G. Simpson’s battery was actually in camp with Third Division, First Corps, at Belle Plain. The Portsmouth location was valid for January 1864, when the return was received in Washington. Battery B: Belle Plain, Virginia with four 3-inch Ordnance Rifles. Another Third Division, First Corps battery. Captain James H. Cooper commanded. Battery C: No location given, but with four 10-pdr Parrotts. Captain Jeremiah McCarthy led this battery, assigned to Third Division, Sixth Corps and likely camping near White Oak Church. Battery D: At White Oak Church, Virginia with four 10-pdr Parrotts. As with Battery C, also assigned to Third Division, Sixth Corps. Captain Michael Hall commanded. Battery E: No location given, but with four 12-pdr Napoleons. Captain Thomas G. Orwig commanded this battery, assigned to the Artillery Reserve of Fourth Corps, and posted at Yorktown. Battery F: At Belle Plain, with four 3-inch Ordnance Rifles. Lieutenant R. Bruce Ricketts commanded this battery, which supported Second Division, First Corps. Battery G: Also at Belle Plain and with four 3-inch Ordnance Rifles. Likewise, another battery, commanded by Captain Frank P. Amsden, assigned to Third Division, First Corps. Battery H: At Yorktown, Virginia with four 12-pdr Napoleons. Captain Andrew Fagan commanded this battery, which was part of the Artillery Reserve, Fourth Corps. Given the type of guns indicated on the first page, we should only see ammunition for 12-pdr Napoleons on this page. But we have some entries under the 12-pdr howitzer columns – both field and mountain – for Battery E (stationed at Yorktown and Gloucester Point at the time). Battery A: 239 shot, 181 case, and 92 canister for 12-pdr Napoleon. Battery E: 176 shot for 12-pdr Napoleon; 64 shell and 192 case for 12-pdr field howitzers; and 80 canister for 12-pdr mountain howitzers. Battery H: 182 shot, 54 shell, 162 case, and 64 canister for 12-pdr Napoleon. There are some possibilities here to explain Battery E. This may be a rather conspicuous transcription error, at either end. Or perhaps a miss-identification of the type of fixed ammunition by some battery officer taking inventory. Another possibility, since the battery was on garrison duty, is the rounds counted included those for weapons not directly assigned to the battery. And of course, 12-pdr howitzer rounds, for either the field or mountain type, work under the “if it fits down the bore” rule. However this return was received in Washington in January 1865, when Battery E was in the Petersburg lines. So we might speculate on this all day. Battery B: 20 canister and 220 bullet shell in 3-inch bore. Battery G: 223 shell and 333 bullet shell for their 3-inch rifles. Battery G: 97 shell, 87 shrapnel, and 80 canister of Dyer’s patent for 3-inch rifle. Battery C: 278 Parrott case shot for their 10-pdr rifles. Battery D: 60 shell and 65(?) case shot of Parrott-patent in 10-pdr. Battery B: 285 Schenkl shell for 3-inch rifles. Battery C: 145 Schenkl shell and 96 Schenkl canister for 10-pdr Parrott. My first impression is that the rifled batteries of the 1st Pennsylvania were short, or maybe under-reporting, ammunition quantities. Battery B, for instance, had twenty canister on hand. Dividing the shell and case shot equitably between four guns, we’d see only 71 shells and 55 “bullet shell” for each tube. Battery A: Eight Navy revolvers and nine horse artillery sabers. Battery B: Sixteen Navy revolvers and seventeen horse artillery sabers. Battery C: Seventeen Army revolvers and fourteen horse artillery sabers. Battery D: Seventeen Navy revolvers and twelve horse artillery sabers. Battery E: Eight Navy revolver, twenty-four cavalry sabers, and eight horse artillery sabers. Battery F: Eighteen Army revolvers and four horse artillery sabers. Battery G: Eleven Navy revolvers and ten horse artillery sabers. Battery H: Seventeen Army revolvers and twenty-three horse artillery sabers. I think that reflects a healthy allotment of small arms for the batteries. Not a lot of pistols or sabers. But enough to meet needs which might arise. And no long guns. Next we will turn to the independent batteries of Pennsylvania. 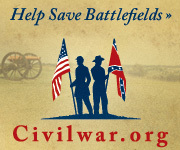 Are there any returns for 1st Regiment and Independent batteries for December 1861 or January/February 1862? 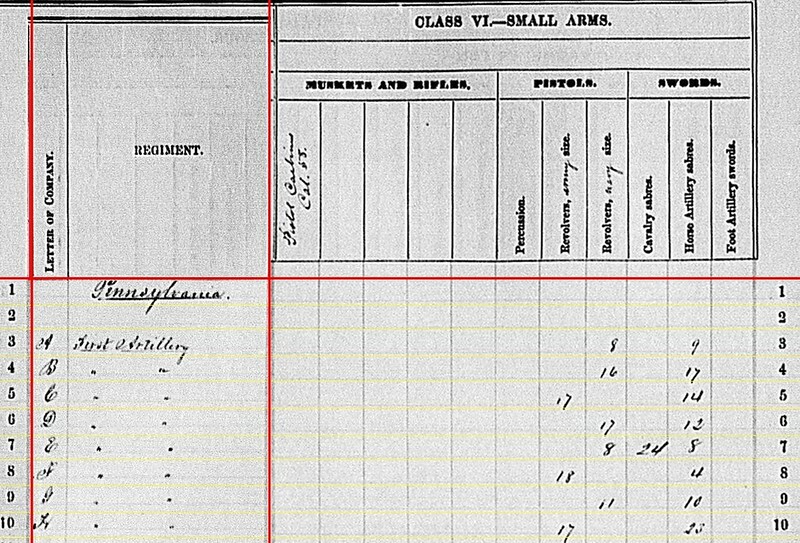 I would like information on Battery “F” 1st PA (Matthews), Thompson’s Independent “C,” and Hampton’s Independent “F” when they were stationed near Williamsport, MD guarding the C&O Canal and B&O RR.